Highlight the hook in green and label its strategy. Did you use a strategy? Quote, question, imagine, interesting fact?? Highlight the thesis in purple: circle of the three subtopics separately numbering each one with 1, 2, or 3. If any words are missing, add them. Reread the connecting sentence just before the thesis. Does this sentence seem to connect the hook and the thesis? Is it choppy? Rewrite if needed to make this sentence smoothly transition from the paragraph's first sentence to the last sentence. Highlight in yellow the topic sentence in all three body paragraphs. Label it t/s. If you have this part missing, add it in. In the t/s, circle the word theme. Repeat for all body paragraphs. If any words are missing, add them. Read the first sentence after each topic sentence. (the explanation part). Do you have at least three sentences of explanation? Highlight in orange these sentences. If you only have one sentence, add two more. 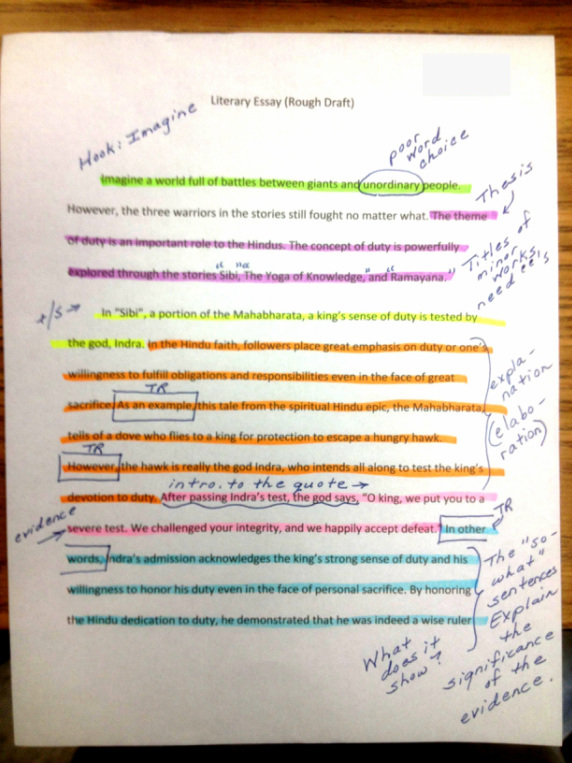 After the“explanation, find and highlight in pink your evidence, the direct quote from the novel. Ask yourself, does this evidence prove what it is supposed to prove? Label this part as “evidence.” Make sure to place quotations marks around the evidence. Find the sentence after the evidence. Does this sentence explain what the evidence’s connection is to theme of duty? 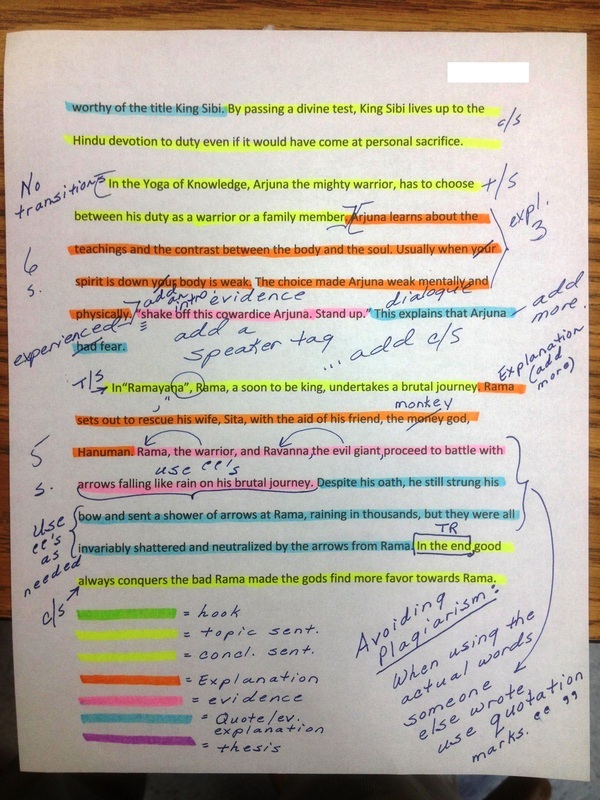 Highlight the evidence's explanation in blue. Using your green sheet of transitions, read your essay to circle all transitions. Count them and write the counts beside each paragraph. Each body paragraph needs four to five transitions. First and last paragraphs need two each. Reread each body paragraph’s last sentence. Is this sentence a concluding sentence, or is it still part of the details? Repeat for all body paragraphs. If it is a c/s, highlight it and label as c/s. If any concluding sentences are missing, add them.